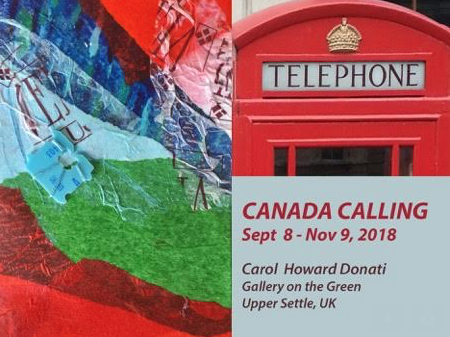 Canadian mixed media artist Carol Howard Donati works with fabric, paint, print, and recycled household materials. An anthropologist by training, the focus of her art is everyday life and how it provides the framework for our human experience. This mixed media collage installation aimed to connect the artist to our local community from a continent away. The show was a 16-card display celebrating the people of Canada. Each of the 16, 4 X 6 cards was comprised of two hand-made surfaces stitched together, back to back: One side collaged and the other printed. The collage side featured an abstract pattern of painted and found papers, commercial packaging, and appliquéd plastics. The print side featured telephone area codes from coast to coast across Canada hand-stamped in red and black ink. The viewer was invited to interact and contribute to the ever-changing nature of this diversity by moving the cards to create new arrangements in the display. “I am inspired by connections of heritage, culture and commonwealth and the opportunity to provide a personal presence in your community”.